26 April 2017 – Bahraini authorities have initiated a new campaign of reprisals against political activists, human rights defenders, and other civil society actors ahead of the kingdom’s third cycle of the United Nations Human Rights Council’s Universal Periodic Review (UPR) beginning on 1 May 2017. We, the undersigned, strongly condemn the judicial harassment of these individuals and call on the Government of Bahrain to immediately lift all restrictions on civil society actors attempting to attend international human rights mechanisms such as the UPR. Over the last week, the Bahraini government has targeted at least 32 activists, human rights defenders, journalists, lawyers, and other members of civil society for reprisal, including criminal summons, interrogations, and travel bans. Nedal Al-Salman of the BCHR was today summoned before the public prosecution and charged with illegally gathering in Duraz village on 27 and 28 January 2017. On 21 April, the authorities summoned two leaders of the Wa’ad political society, Ebrahim Sharif and Farida Ghulam, to appear for interrogation several days later. They were accused of participating in an “illegal gathering” in the village of Diraz and subjected to a travel ban. Both Sharif and Ghulam have not visited the village in years. Diraz has been the site of an ongoing peaceful sit-in since June 2016, when the government stripped the country’s most prominent Shia religious leader, Sheikh Isa Qassim, of his citizenship and began prosecuting him for his role in a traditional Shia practice, known as khums. The Government of Bahrain used travel bans in 2016 to prevent dozens of civil society actors to travel – specifically in advance of UN Human Rights Council sessions. BIRD documented 28 individual cases in 2016, while some activists estimate as many as a 100 have had their freedom of movement restricted by the government over the years. Interfaith leader Sheikh Maytham al-Salman notes that as many as 47 independent civil society actors attended Bahrain’s second UPR cycle in 2012, whereas as few as one or two may be able to participate in the upcoming review. The bans have come in the weeks ahead of Bahrain’s UPR, which begins on 1 May in Geneva, Switzerland, at the UN. The Government of Bahrain has refused to formally engage with independent civil organizations in the UPR consultation process. Authorities have outright banned domestic human rights groups like BCHR and declined to cooperate with international organizations like ADHRB and BIRD. 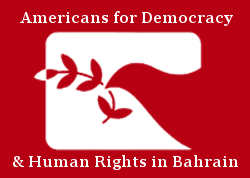 ADHRB directly contacted the government requesting to participate in the national consultation process, and was rejected; an ADHRB officer even submitted a 12-page visa application and formal request to travel to Bahrain to take part in the consultation, including a full itinerary, and never received a response. Meanwhile, the authorities claim to have consulted with several “associations concerned with human rights,” but they have not disclosed these organizations or if they included government-organized NGOs (GONGOs), which are funded and/or sponsored by the state and that do not face the same restrictions as independent groups. In contrast, BCHR, the Bahrain Youth Society for Human Rights, the Bahrain Human Rights Observatory, the Bahrain Nursing Society, the Bahrain Human Rights Society, the Bahrain Teacher’s Union, the Bahrain Medical Society, the Bahrain Lawyer’s Society, the Authors and Writers Family Society, and even the Bahrain Photographic Society, among others, have all been subjected to some form of judicial harassment since their establishment, including the imprisonment of members. The government’s increased attacks on independent civil society reflect a broader trend of disengagement from the UPR reform process. ADHRB, BCHR, and BIRD assess that the Government of Bahrain has actually backtracked on instituting many of these reforms since the UPR midterm in 2014, with 133 of its 176 second-cycle recommendations wholly unimplemented. In many cases, the authorities have actively contravened key recommendations, such as to formally prohibit military trials for civilians or end the use of torture. “Bahrain should allow the free participation of civil society in the UPR Process without fear of reprisal or intimidation,” said Said Yousif Al-Muhafdha, BCHR’s Vice-President. We therefore call on the Government of Bahrain to lift all travel bans and end any other form of interference in the work of independent civil society actors. We specifically urge the authorities to facilitate the attendance of these actors at the upcoming UPR in May and to genuinely commit to the UPR reform process.